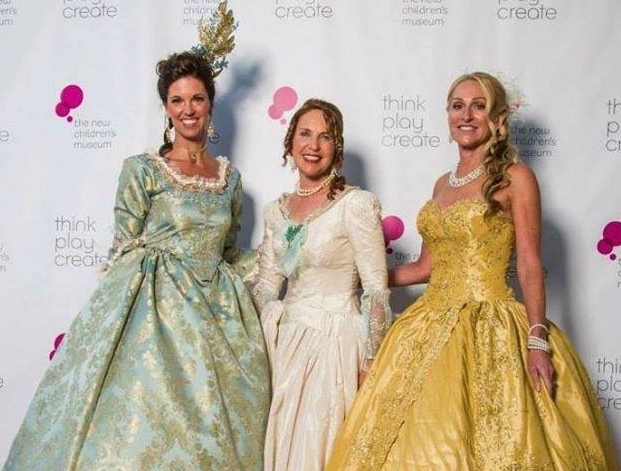 Event Co-Chair Michelle McSweeney Alexander, NCM Executive Director Julianne Markow, and NCM Chairman of the Board of Directors Celeste Hilling, all styled by LEO DUO. The event was a smashing success. Many kudos to the visionaries and volunteers who mounted such a spectacular evening. There is a story we must share about one of those visionaries, Julianne Markow, the Executive Director for NCM. While LEO DUO was fitting a gown on one of the event's co-chairs, Julianne approached us for our opinion. Should she wear a tasteful but safe modern gown, or take a risk and wear a gown with a more period silhouette? Naturally, we emphatically lobbied for the period-looking gown. It turns out the gown was her wedding dress, an absolutely stunning silk confection she had worn 25 years earlier. (Our hats are off to you for still fitting into it, Julianne!) We were entrusted with this prized possession, and gingerly hand-stitched (easily removable) colorful details with vintage flair to make it less bridal and more party appropriate. Julianne, thank you for your faith - you were truly one of the belles of the ball! Alexander the Great! Making a grand entrance in LEO DUO finery. Another beauty commanding attention all evening was none other than Alexander Salazar, of Alexander Salazar Fine Art. He made quite the splash in his LEO DUO Louis Meets Liberace hot pants and pannier ensemble. As smashing as he looked, he eventually changed his outfit...and donned a LEO DUO gown we had created especially for the Feasting in Versailles event! This is a man who knows how to have impact - what a fun client to design and create for! He worked the long train throughout the live auction (the front of the gown was short, showcasing those fabulous legs of his), then changed (once more) back into his hot pants, brocade vest, and silk shirt before hitting the San Diego clubs late in the evening. Our LEO DUO Lady, with her tempting tray of crystals. In addition to coordinating costumes for various attendees (including Alexander Salazar, who made quite the splash in his Louis meets Liberace hot pants and pannier ensemble), LEO DUO sponsored a portion of the evening's entertainment. Our costumed performer (the lovely Julie Sachs!) mingled with guests during the cocktail hour, applying Swarovski beauty marks in an array of sizes and colors from her bedecked and bedazzled LEO DUO tray. Party-goers seemed to really enjoy that little touch of luxe reminiscent of the excesses of the court of Versailles. Make sure you visit the New Children's Museum to experience their new exhibit "Feast: The Art of Playing With Your Food" for some fantastic interactive fun!